Here we are again, at the beginning of a high expectation season. For me, expectations equal stress, which is why this is so ironic. Summer time is supposed to be a casual, easy time. No stress. But let’s be real. We only get a handful of summers with our kids before they are grown up. And if you are like me, we want to help them make some great memories of summer time. Plus, summer is a great time of growth for kids, both physically and otherwise. The real cause for the stress from expectations? The comparison game. It’s strong come summer time. For me, it starts with all the summer time movies of awesome camps, cookouts, time spent at the lake, amazing Fourth of July scenes where there doesn’t seem to be a lot of crowds and everyone is having a good time. It creates a false expectation of the laid back, fun in the sun summer. Then we can add a second layer of comparison with social media. Seeing people talk about their travel plans, fun things they are going to do, their kids dressed up in cute summertime outfits and mini sunglasses. It can stress you out. Well, it stresses me out. But, what if it didn’t have to be that way? What if you could be intentional about your summer and design it…almost like a work project? Alright, so let’s start with a goal. What is your desired outcome for the summer? Let’s go a bit deeper here than “just have fun”. Think about coming into September and looking back on the summer and answer these questions. What do you want your kids to learn this summer? How do you want them to describe the summer? How do you want to describe the summer? Now that you have a goal and a direction to go in, let’s lay out the realities of the situation. Let’s talk timeline and budget. Pull out a calendar with your kids and count the days of summer. How many days do they have? Next, write out all the activities that they already have planned. Summer camp, VBS, going to grandmas…..
Then, and without your kids knowing what you are doing, look at your work calendar and their activity calendar and count how many full days you have with them. Chances are, it’s not a lot. Now there are a lot of things that you can do in the evenings and even before work. Things you can set them up with for while you are working. We can still make an impact toward the goals for them while we are working, but knowing how many full days we have will give us a reality to base activities off of to reach our overall objective. So, how many days do you have with them? Now that we have a clear goal and timeline, let’s look at the budget. How much money do you have to spend on summer this year? Obviously, some of your already allocated budgets can go to having an awesome summer. Things like food can make a big impact. This is where stress can start to come in. Some of the expectations that we have for summer require a lot of time and/or money. If we don’t have the time and money to create that expectation, that is where we can have the adult version of a temper tantrum. We don’t call it that, we call it stress and guilt. However, by being intentional about it ahead of time we can take an objective look at the situation, and choose something different. Look at your budget and talk to your husband. How much money can you put toward summer activities and fun? Whatever the number is, you can work with it. Just like you do every day. You are creative and resourceful. Now that we have laid the groundwork, it’s time to start planning the fun stuff! They give me their top 2-3 things and we write it down. Now, just for fun, we write it down on a big sheet of paper. You know the ones, easel paper with sticky note stuff on the back? I highly recommend buying one of the easel paper packs with a dry erase front to have at your home. We use it all the time for games, planning, school work. It’s only about $35 and a great tool. Click here to see what I’m talking about. Then, I write down my 2-3 things that are my must-dos and my husband does the same. Looking at the kid’s list, you want to compare it to the calendar. This momma, is where we need to stay in check. Often times, we want to be involved in all the special times. We plan things so that we are the center of what is going on. We gotta let that go. What is important is that the kids are getting what they need, regardless of who is giving it to them. As a working mom, you may have already overcome this. But if not, pray about it. We can’t make it about us, we have to keep it about the kids. Ok, so look at their list and see if they are already getting some of the things from the list. For example. My son wants to go fishing. He already has a fishing trip planned with his uncle. Sweet, done. Now in truth, we will probably go fishing a lot because it’s and moves us closer to our goals of quality time outside an unplugged from electronics (that is my goal for the kids this summer). But, if we weren’t able to go more often we can still cross it off the list. Now, let’s come back to the point I was talking about earlier….about your involvement with the list. Look at the list and pick just 1-2 things that are most important that you are there with the kids for. For so many of my past summers, my husband was staying at home with the kids and would take them places and have fun during the day. That was his job. I can remember coming home from work and hearing about a movie that they went to go see. It was a movie that the kids were really looking forward to seeing and knew they would be talking about it a ton. And I wasn’t there to watch it with them. It wasn’t about the movie, it was about feeling like I was missing out on an inside joke. It’s the little things that can make being a working mom hard. After that experience, I started communicating the things that were important that I was there for. That way my husband and anyone else taking care of them knew that I wanted to do those things with the kids. Making summer memories are just as much for you as it is for the kids. These are memories of your babies youth that you will carry with you as they grow. Speak up without guilt. Now, let’s put all the pieces together. Let’s plan this summer! I have put all the pieces that we talked about in a handing planning guide for you complete with your calendar, and many more bonuses to intentional make this summer awesome. Click here to let me know the best email to send it to. We have to align the time available with the activity and when the budget is available. This can be a balancing act, but I know you can do it. There isn’t a lot I can tell you on this part because it will be different for each family. Now that you have the major events planned for summer, let’s talk about the small stuff. Sometimes this is where the magic really happens. For this section, we are going to break it up into practical and the awesome. Let’s talk summer routines for kids. This is a bit of a hard one. Well, it can be. We will be having an expert sharing about this inside our Life Balance Membership as part of our intentional summer series. If you are not yet a member, now is a great time to join so you get all the extras and bonuses that go along with the summer series. For me, I will be mandating a bedtime and wake up time but it will be very generous. Instead of a schedule, I am creating a checklist and using some of what Lindsay McCarthy shared a few episodes back. If you missed that episode, it was #75. She is the co-author of Miracle mornings for parents and families. While we are talking about practical things, let’s talk about your supply list. Here is a link to my recommendations from Amazon. But like my husband says, you have to have the right tool for the job. Things like Sunscreen, sing ointment, water bottles, and the fun stuff like glow sticks and sidewalk chalk. Look at your list of activities and determine what items you will need and get them ahead of time. 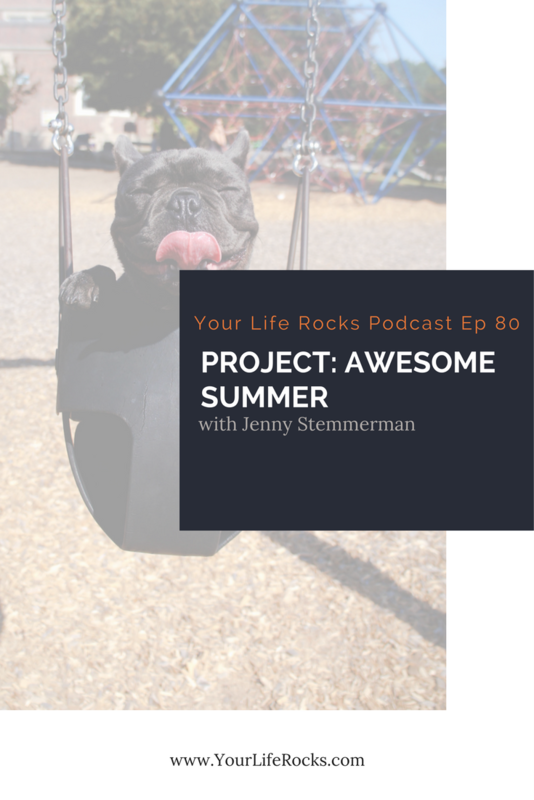 Did you know if you click here and shop Amazon you are helping to support the Your Life Rocks podcast? When I was growing up, my mom was not very practical. You won’t hear me talk a lot about my mom because it’s just too painful to share much about, but I will say this. She was really great at making things special and magical. I am so thankful that God gave me that through her. This is the fun stuff. There are a lot of little inexpensive things you can do to make summer special. From building a fort out of blankets and letting your kids sleep in it to pancakes that are the shape of the sun (yes the sun is a circle and so are pancakes but it’s all in the presentation). Think of the things your kid’s love, and work that in. We have a party on the last day of school. We don’t invite people over, but we celebrate. The kids get a summer survival kit complete with flashlights, glowsticks, art supplies, and fishing gear. They love it and it makes an official launch into summer. Any little thing like family walks after dinner, ice pops in the freezer and sparklers on evenings that aren’t the fourth of July. They all work together to create memories with your kiddos, and for you. Don’t underestimate the effect food can have. The smells and tastes of summer can be amazing, so dive in! Inside Life Balance Membership I will be sharing a few of my favorite summertime recipes. Really, don’t think these things are not important because they are. The smell of the barbecue, corn on the cob, strawberries, and crawfish bakes. They are the food of summer time for us. What food reminds you most of the summer? Ask your kids the same question and make sure you include those foods often this year. Now that we have talked about executing project summer awesomeness, let’s talk about review your progress. Please hear me when I say, hold these plans loosely. Slow down and breath deep. Remember your intentions at the start of this process. Remember the desired outcome. Sometimes we get so attached to the tactics, the stuff in the middle. Give yourself lots of grace. Know that not everything will go as planned. Don’t stress. Be as present as a possible. Listen to the stories your kids tell. Teach them things. Laugh, skip, and splash in the water with them. Summertime is precious. Just like every other time in the year. It’s a blessing. Thank God for what he has given and pray for safety and that the kids would get a better glimpse of him as they play in the sun.